After a brief albeit stormy hearing in the petition of Alok Verma, which ended with Chief Justice Ranjan Gogoi adjourning the proceedings till November 29, the Supreme Court on Tuesday (November 20) held the CBI director responsible for leaking confidential details related to the case while lamenting the evident lack of respect for the institution. Chief Justice Gogoi had, moments after the hearing commenced, asked Verma’s lead counsel, senior advocate Fali Nariman how confidential details related to the case were being published by sections of the media. Nariman had told the bench that the leaks were “unauthorized” and that the court could “summon the editors” for further information. The Chief Justice had also told Nariman that the bench wasn’t happy at the manner in which senior advocate Gopal Sankarnarayanan had approached the court, on Monday (November 19), seeking additional time to file Verma’s reply to the CVC inquiry report. The bench had, last week, granted Verma time till November 19 (1 P.M) to file his reply to the inquiry report. Sankarnarayanan had approached the bench on Monday morning seeking an extension of the deadline following which the court had directed that the reply must be filed by 4 P.M the same day. Verma’s reply was submitted to the Supreme Court’s registry in a sealed cover a couple of hours later. However, after the Chief Justice expressed on Tuesday that he was not happy with Sankarnarayanan approaching the bench for additional time, Nariman claimed that the request had not been authorized by him as Verma’s lead counsel and that he had got to know of the development only through the media. Shortly after the bench adjourned the matter, Nariman approached the Chief Justice and apologized for the goings-on that had upset the court. The senior advocate then asked the Chief Justice to grant him some time to make certain clarifications. Nariman sought to pacify the bench by stating that the article published by The Wire was about Verma’s response to the CVC questionnaire during the course of the investigation and that this response was not covered by the confidentiality order of the top court, which was specifically on the final inquiry report and Verma’s response to it – both documents currently under perusal of the bench. Nariman asserted that there had been “no violation of the SC order”. Senior advocate Sankarnarayanan then approached the bench stating: “I would like to clear my name”. Earlier in the day, Nariman had told the bench that Sankarnarayanan had not been authorized to approach the bench on Monday for seeking an extension for filing Verma’s response to the CVC inquiry report. While the bench declined to hear Sankarnarayanan’s clarification, another advocate-on-record (AoR) who had previously appeared for Verma told the bench that the CBI chief had authorized her and Sankarnarayanan to seek the extension. The Chief Justice then made it clear to the sparring lawyers that it was not inclined to hear anyone except Nariman. Nariman told the court that the mentioning done by Sankarnarayanan was wrong. “Nothing is mentioned in the court if a senior is involved,” Nariman said, adding that as Verma’s lead counsel, he had not authorized Sankarnarayanan to appear before the bench on Monday and ask for an extension of the deadline to file the CBI chief’s response to the CVC inquiry report. The bench then also noted its displeasure over the publication of the petition filed by senior CBI officer MK Sinha challenging his transfer from the SIT probe into corruption cases against Rakesh Asthana. Sinha was among a slew of officers who were probing Asthana and were transferred hours after the Centre ordered Verma and Asthana to go on leave on October 24. Interim CBI chief Nageswara Rao had transferred all officers probing Asthana out of Delhi. 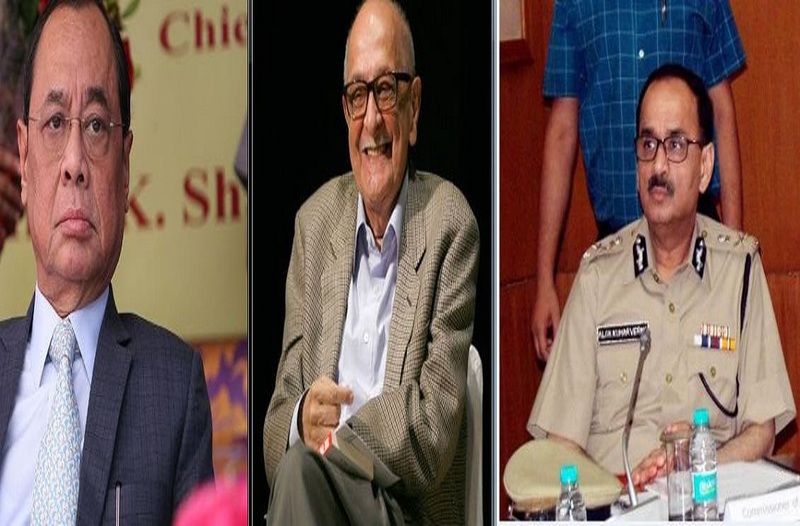 Each of these officers have now filed separate petitions before the Delhi High Court and the Supreme Court challenging their transfers and each plea has made specific and startling claims not just about the affairs within the CBI but also against high ranking officials in the Prime Minister’s Office – including National Security Advisor Ajit Doval – and a junior minister in the union council. Sinha’s petition, filed earlier this week alleges that Doval was trying to shield Asthana in the corruption cases being investigated against the CBI special director. The claim was, obviously, reported widely in the Indian media. Sources say that much of what Sinha mentions in his petition is the same as what Verma has explained in his confidential reply to the CVC inquiry report. Verma’s detractors have been claiming that since he could not violate the SC’s confidentiality order that prohibited him from sharing details of his response to the CVC inquiry report with the press, he got Sinha to file a petition that made the same claims, knowing that the press would lap it up owing to the grave allegations made in it. How the top court proceeds in the case when it comes up for hearing next on November 29 remains to be seen. What is certain, however, is that the mess emanating from the CBI turf war is only getting murkier and the Supreme Court is supremely angry over the fallout.